Whether woodwork is your profession or just a hobby, your workshop cannot be termed as complete without a planer or two at the least. However, not any planer, you should get the best planer – no compromise. A planer ensures that your final product is nothing short of a masterpiece and adds a more professional look to it. Advancement in technology has seen the production of more versatile and modern planers; this review will delve more into small units that are suitable for small-scale use. The larger planers are designed for heavy-duty use, which means that they are only suitable for industrial use. This review will also focus on the various types of planers and some of the best planers in the market. What are the different types of best planers and what makes them different? Hand Planer: The hand held planer has a handhold that allows for a firm grip as you carry out your planing work. They are cheaper than the other types and allow the user for more control over the planing work. They have dials and buttons that allow for a seamless operation and control when planing. Thickness Planer: A Thickness planer features 3 distinct things; a roller to slowly move the wood towards the cutting head, an adjustable table to help cut through thin and thick boards and lastly there is a cutter. 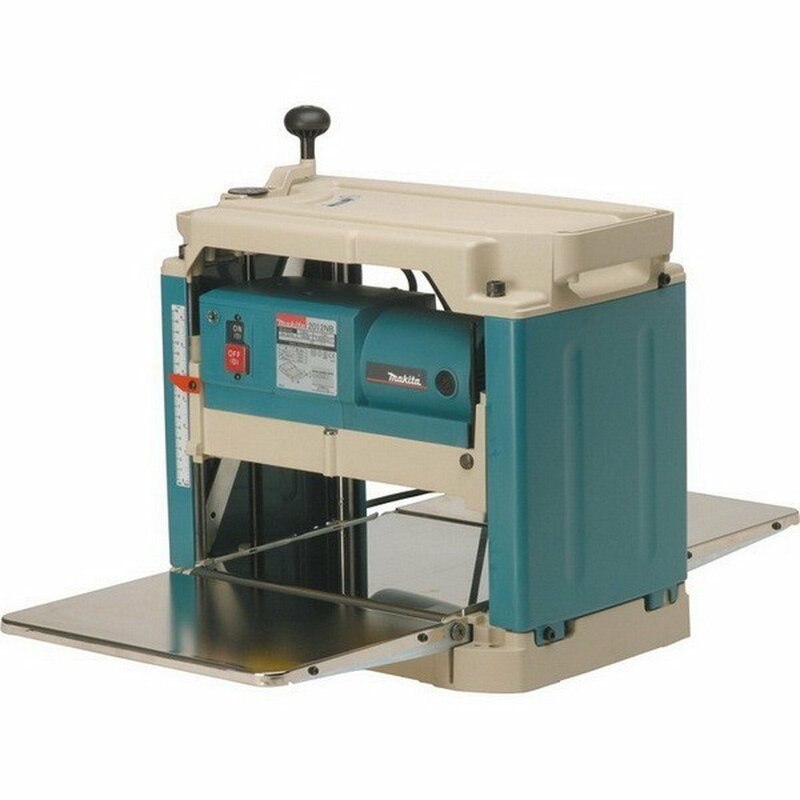 Jointer Planer: Just as its name suggests, a joint planer is a combination of two tools. It can function as a planer or a jointer. It helps save on space and money. Portable Planer: Portable planers are designed for serious tasks and weigh more than their hand held counterparts. Some portable planers come with removable tables that easy to put up. Although they are heavier than handheld planers, portable planers are easy to move around from one to another. Benchtop Planer: Although most people tend to refer to benchtop planers as portable planers, they are quite different in that the benchtop planers weigh more and consume more space. They are for heavy-duty use and can handle more tasks than the average planers can. They are sturdy and include a table that supports the wood and the planer when planing. Although the tools you purchase will largely depend on your set budget, you should also consider the work you want to use it for and the project you want to carry out. If you are looking to create even surfaces and smooth edges, opt for jointer planers. Experts recommend that hobbyists and beginners invest in purchasing joint planers before they decide to use the heavy and larger tools. Table size : Since the worktable goes hand in hand with the planer, it is important to consider the size of its cutting area as well as its overall size. Most planers can support boards that are 15” wide or thick but if you are looking to handle more intense projects, I suggest you buy a planer that can support up to 20” of board width or thickness. ​Cutting Area : Planers have blades that are of different style and shapes depending on the make. Most professionals prefer helical blades to others, as they are faster. While others prefer spiral blades as they provide smoother surfaces. ​Noise: Before you purchase a tool, ask for a “road test” this way you can pick a planer that suits your needs and is not quite noisy. Hand planers tend to produce a lot of noise as compared to their benchtop counterparts. However, hand planers might not have the required strength to tackle heavier woods. ​Motor: There are two types of motors; universal motors and electric motors. Many cheap models are fitted with universal motors and while they are effective and lightweight, these motors are not the best when it comes to handling harder wood. Electric motors are more powerful and flawless in precision working. When buying a planer choose one with a high RPM and powerful motor. Now that you have a clear picture of what to consider when shopping for a planer, you can go through best wood planers discussed below. To help you pick the best planer 2017, here are planer reviews, from the brands. A 15 Amp motor that makes 20,000 rpm and can handle large deep cuts in hard woods powers the DW734. It features a three-knife cutter head that can deliver 10,000 rpm thus providing 96 cuts per inch. This makes it deliver one of the finest finishes of any portable planer. The disposable, razor-sharp reversible knives are easy to change and can deliver up to 30% more knife life. For fast and easy one-tool knife changes, the DW734 has a set of pins attached to the cutter head to go through the holes on the knife. Its four-column carriage lock rapidly reduces any movement that could cause snipping. The extra long infeed& outfeed tables can provide up to 33 ½ “of material support. It also has a turret depth stop that makes it easy to set the machine at commonly used depths. It is the best wood planer for the money. In addition, the extra-large thickness scale and material-removal gauge ensure that every pass is accurate. The DW734 has a dust hood attached to a standing dust collector (sold separately) or a shop vacuum for efficient collection of debris and chips. It is quite sturdy considering that it weighs 80 pounds. It offers a cut depth of 1/8”, a depth capacity of 6” and a width capacity of 12 ½”. It comes with a warranty package that includes a one-year limited service contract, a three-year limited warranty and a 90-day money-back guarantee. Inside the box, you will find the DW734 DEWALT 12 ½” Thickness Planer, a dust hood and the three-knife cutter head. Fabulous finish on the boards thanks to the 20,000rpm motor. The dust collector is very efficient and collects most of the shavings. Sub-par quality control on the assembly parts. The DW735X gets it energy from a 15 Amp motor; it can make 20,000 rpm (10,000 rpm cutter head speed). This means that its motor is so powerful that it can cut accurately and fast. It has a three-knife cutter head that is easy to change and can deliver up to thirty percent longer knife life. Chip offs are vacuumed off the cutter head by the fan-assisted chip ejection and are later exhausted out of the planer. The 19 ¾ “base makes it more rigid than the standard 10” base. The DW735X has an automatic carriage lock that reduces any movement that can cause snipe without the user manually engaging it. The extra-large thickness scale and material removal gauge makes accurate cuts with every pass it makes. Its extra large turret depth-stop allows the user for easy return to the frequently used thickness. It comes with an extra set of knives, outfeed and infeed tables. In terms of speed and raw power, the DW735X is an improved version of the DW735 and the DW734. For just an extra investment, you can get the improved version of both the DW735 and the DW734 with all their weaknesses filled. 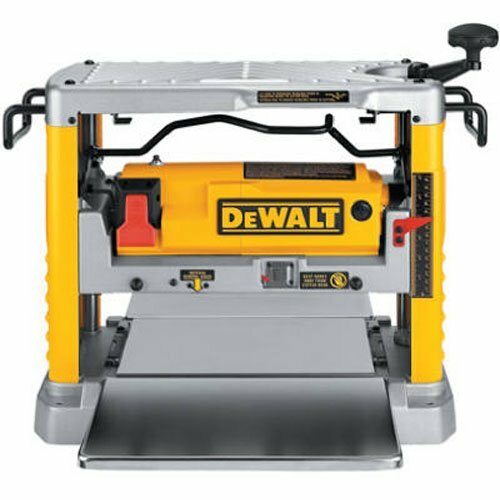 The DW735X is a benchtop planer and measures 24” by 22” by 18”, its knives are 13 inches thick. It can make 96-179 cuts per inch. It uses electricity as its power source, has a one-year warranty and a 30-day no-risk trial. The DW735X is arguably the best thickness planer available in the market today. In conclusion, there are enough reasons why this unit features in our list of best planer 2017. It’s a great planer and the fan-assisted vacuum actually works. It works better on smaller pieces and makes very fine cuts. Although it is heavy, it is still portable. Installed magnets makes blade removal very easy. It has a handy tray for mounting screws when changing the blades. Although the DW735X has many advantages, it has one down side in that it is quite expensive compared to its predecessors. Do you want to bring your old unevenly cut boards back to life? 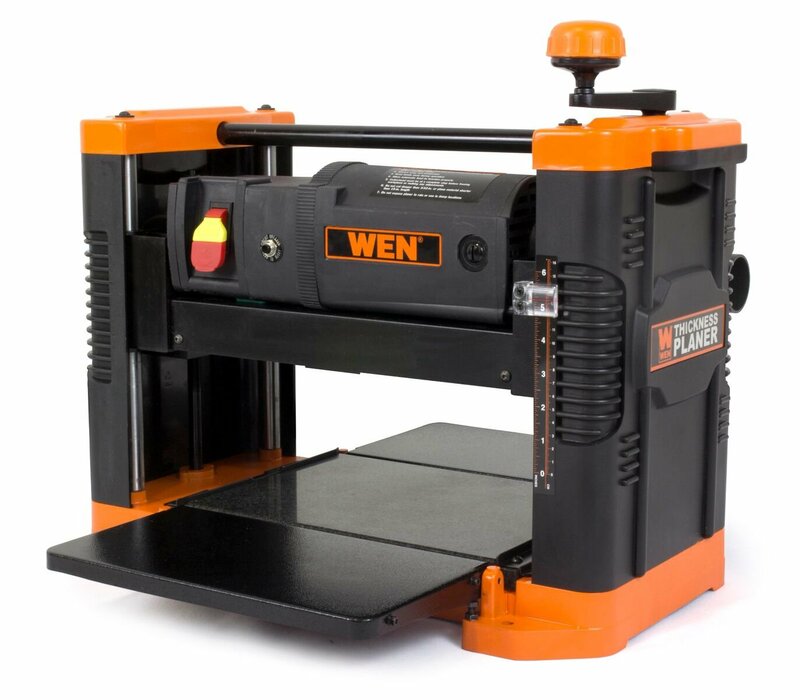 Look no further, for with the WEN 6550 Benchtop Thickness Planer you can repurpose worn out or rough wood to give it a superior smooth finish. It is powered by a 15Amp motor, which is combined with a two-blade cutting system that provides over 18,000 cpm (cuts per minute) at a 26 fpm (feet per minute). Its plane can board up to 6” thick and 12.5” wide. The granite table provides accurate support to wood as it is passed through this machine. Granite is highly durable, it never distorts or wraps over time. It also provides a smooth & non-marring surface for wood to glide over safely. Granite also ensures that the sawdust does not cling on to the table. The infeed & outfeed tables and two side-mounted handles make it easy to transport and rearrange. The handles are designed with hollowed-out insides to create enough room for you to wrap your fingers around. If you want to move it around, you just have to collapse its tables and grab the two handles and your machine is ready to move. This is a strong reason why this unit is one of the best planers there is on the market. The WEN 6550 has a sturdy build and weighs slightly over seventy pounds. The cast iron base combined with the all-granite table provides a solid foundation for the thickness planers to rest on. If that is not enough, you can utilize the mounting holes at the bottom of the frame to increase its stability. Being a WEN product, it comes with a 2-year warranty, friendly customer care and a nationwide network of technicians ready to service your machine in case of anything. Its tri-roller system helps minimize snipe. The rubber adjustable handle allows for precise measurements. Adjustable infeed & outfeed tables makes it easy to get perfect angles for feeding boards smoothly. A fraction of the outfeed table’s lip rests above the granites surface and if not well handled it could take a big chunk out of your lumber. A worldwide company known as Makita manufactures the Makita 2012NB. Makita engineers its power tools using leading-edge innovation to produce more energy efficient and compact tools. All their tools are designed to deliver results as well as industrial strength power. 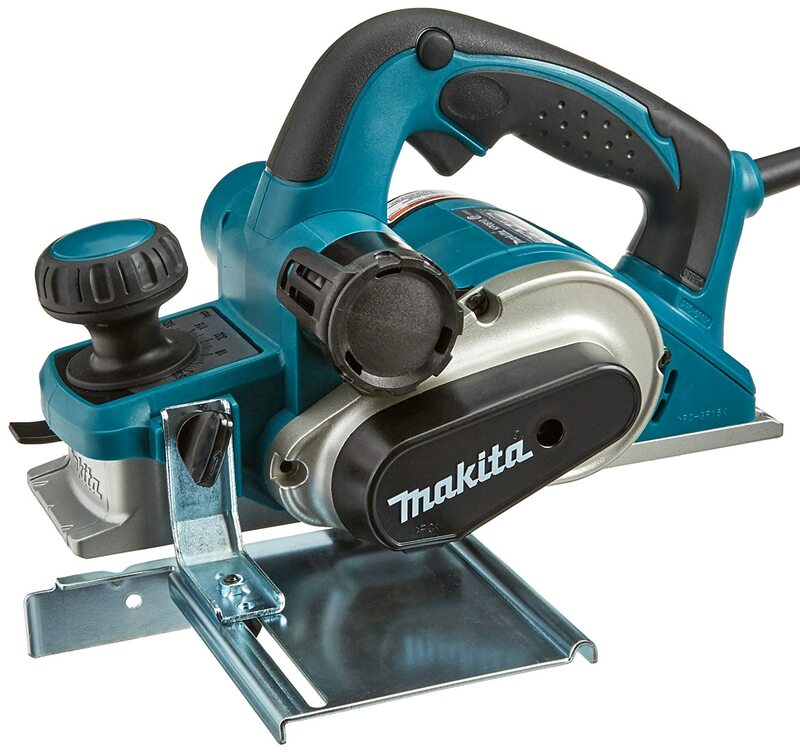 The Makita 2012NB is no different; it is designed for finish woodworking, which makes it ideal for furniture, staircase, cabinets, closets and many more. A 15Amp motor powers the 2012Nb and its no-load speed is 8,500 RPM. It appears to be quietest planer (83dB) in its class. It features a 4-post design and diagonal cross supports for improved stability. It also has large table extensions designed to support the work piece and adjustable depth stops in case of repeat cut. Its feed rate stands at 28 feet-per-minute and has an adjustable cutting depth setting for easy precision planning. The Makita 2022NB is lightweight but compact for easy transportation to the working site. It uses disposable double-edged planer blades, which are faster and easier to change. It has LED lighting to indicate when the planer is plugged into a power source with a large paddle on/off witch for easy operation. The 2012NB comes with a detachable toolbox where you can store standard equipment. It also has an optional dust hood on to which a dust collection system can be connected. Inside its shipping package there is a socket wrench, a hex wrench (783208-8) and 2 ea. magnetic holder (762014-4). It is quieter than even a Skilsaw. Has no set up time, no chatter, no slipping or clogging. Weighing only 40 pounds, the Makita is easy to move around. It is very accurate and refined. Other than a few claims that it snipes of a little bit of wood, the Makita 2012NB does not seem to have any other downsides. 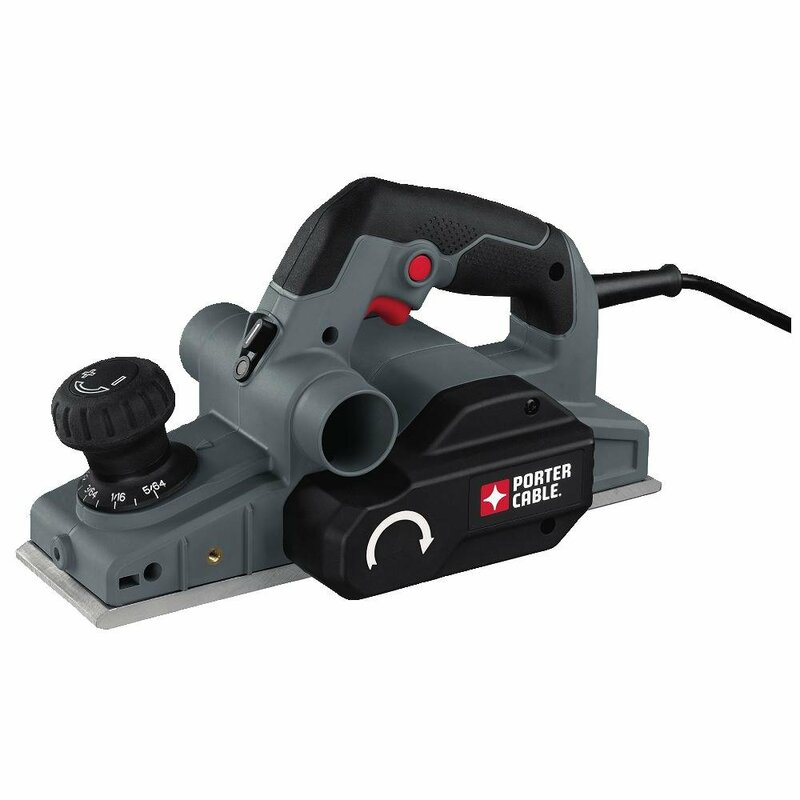 The PORTER-CABLE has a sleek design, three chamfer grooves that allow for edge chamfering and it is powered by 6-Amp motor. Although it might sound small, the motor is actually quite powerful for hand planing and does some nice finishing. Even at just the first glance the PORTER-CABLE seems like a perfect tool for shortening joists, doors, planing wood planks, profiling and chamfering corners and edges. The 5/64” cut per pass removes excess material in very little time. The PORTER-CABLE is packed with two blades, they are both carbide-cutting blades but it can also use high-speed steel blades. High-speed steel cutting blades are more efficient in that they are suitable for aggressive planing such as planing wood that has nails. On the other hand, carbide-cutting blades are perfect for craftsmen who would not want to risk jamming their blades on anything than wood. With one of these, you can easily adjust depth using the 11 stops positioned at every 1/128th of an inch up to the maximum 5/64”. Most planers do not offer this kind of fine differentiation between the depths, which makes it one of the best handheld planers for precision work. The 3 different sized chamfering grooves allow for various types of bevel cuts with a guarantee of the highest level of proficiency. It has a kickstand that protects the blade in times when it is not in use. The handle is designed in an angle that makes it easy to drive the plane forward and still maintain enough downward force to retain the required tool level and keep it straight. Suitable for more aggressive works. Its ability to toggle chip direction is an added advantage. It has a short cord-6 ft. Although the DEWALT DW680K is manufactured in China, it is quite durable. 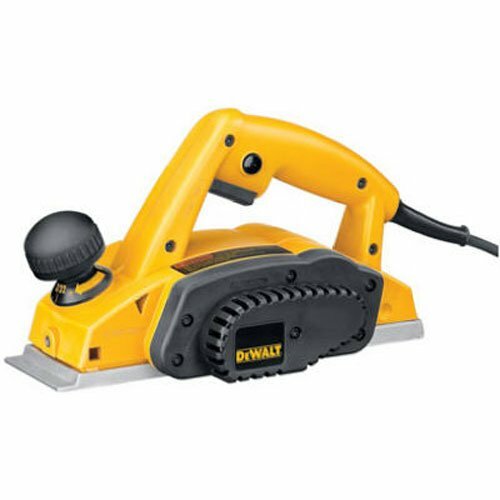 It comes with a 7 Amp motor that can deliver 15,000 rpm for heavy-duty use and provides a smooth and even finish even when used to plane very hard wood. In just a single pass it makes a 3/32” cut thus reducing the amount of time it takes to get the desired finish. It can handle precision work due to its high-speed steel blades. It has an ergonomically designed handle for improved comfort when using it. The DW680K’s cutter head accepts carbide cutting blades and high-speed steel blades. Reversible carbide blades are suitable for accurate and more detailed woodworking. On the other hand, high-speed steel blades are suitable for framing applications or straight edging. The DEWALT DW680K is the best portable planer currently available in the market. 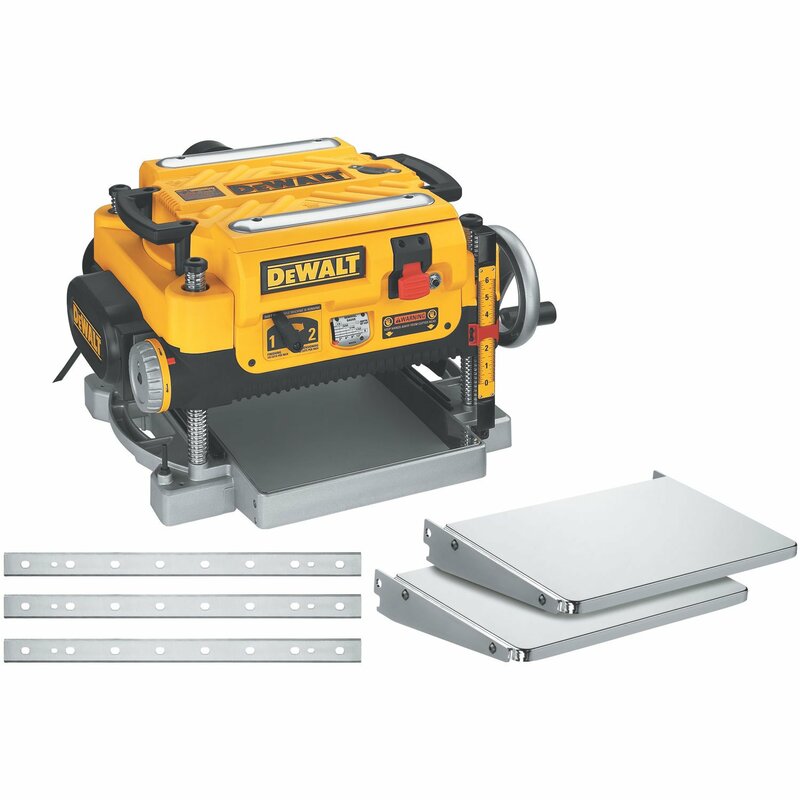 It is much more powerful than the smaller DEWALT planer. The 2-finger trigger makes it easy to operate. For strengthened longevity, it comes with a poly-v drive belt. It is not suitable for left-handed users as it is designed with the exhaust port on the right side. Are you looking for a planer that can smooth out joists, flush uneven boards, plane away, splinters, misshapen edges and chips? 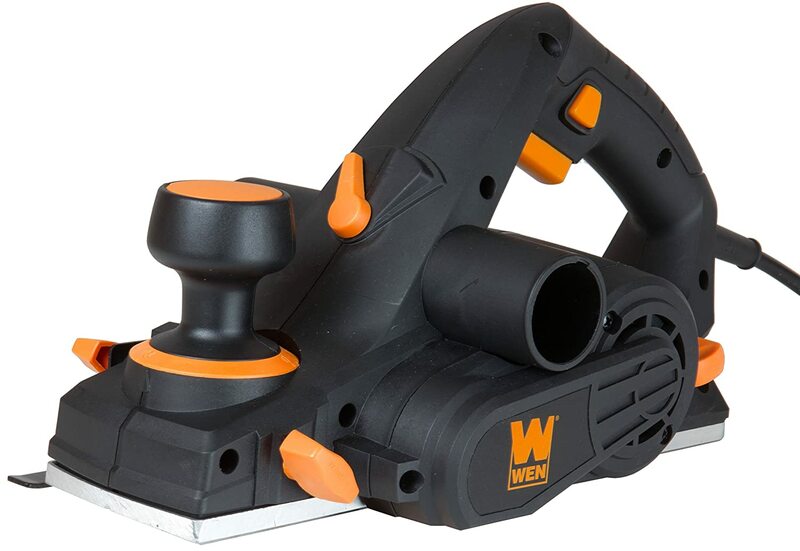 Look no further for with the WEN 6530 you can handle all this activities and even more. It has a 6 Amp motor that can deliver over 34,000 cpm and slice away any irregularity until the workpiece is smooth and well aligned. It has a cutting depth of 1/8” and cutting width of 3 ¼”. It also has 16 positive stops that allow for easy increment of 1/128” from 0-1/8”. Its base plate shoe has a v-shaped chamfering groove for flattening sharp corners of the board. Perfect for rabbeting and chamfering. The protective kickstand prevents unwanted cuts. Has a parallel fence bracket that ensured correct measurements and straight cuts. The dust divider does not stop dust from coming out of the unused side. The Makita KP0810 comes with a 7.5 Amp motor; it can make 16,000 RPM and has a two-blade cutter head. It is equipped with double-edged carbide cutting blades for improved performance and can chunk out 3 ¼ “in width and 5/32” in depth in just a single pass. It has rigid aluminum housing for a longer service life and supports the drum for enhanced durability. The Makita KP0810 weighs about 7.3 pounds, has a rubberized handles to comfort when operating it. Its stand is loaded with springs to elevate the base, which in turn protects the workpiece and the blades. Its chip ejection is adjustable such that you can direct to any side of the planer. It has an easy-to-read scale that makes click stops in every 0.1-millimeter increments to facilitate for precision planing. The chamfering grooves come with three options; 1.4 mm, 3 mm and 4 mm. It also has a lock-on button that is conveniently located for uninterrupted operation. The Makita KP0810 is designed for professional framing, fine woodworking, door and window installation. The package consists of; one Makita KP0810 Planer, a wrench, a blade set, a depth guide, a guide rule and a blade gauge assembly. The spring-loaded standoff improves stability. The lock-on button allows for uninterrupted operations. It works great until you attach the dust collector it starts sounding like a fire engine. Does not include a hardshell case. Before you buy any planer, it is important that you do thorough research, buy a product that will satisfy your needs. While there are many planers labeled as the best planers in the market, some are low quality and will only disappoint you. If your product does not satisfy your needs, it does not necessarily mean that it is faulty; it may be that you chose the wrong product. Therefore, choose your planer wisely so that you do not end up having trouble during woodwork. We hope these planer reviews have helped you.